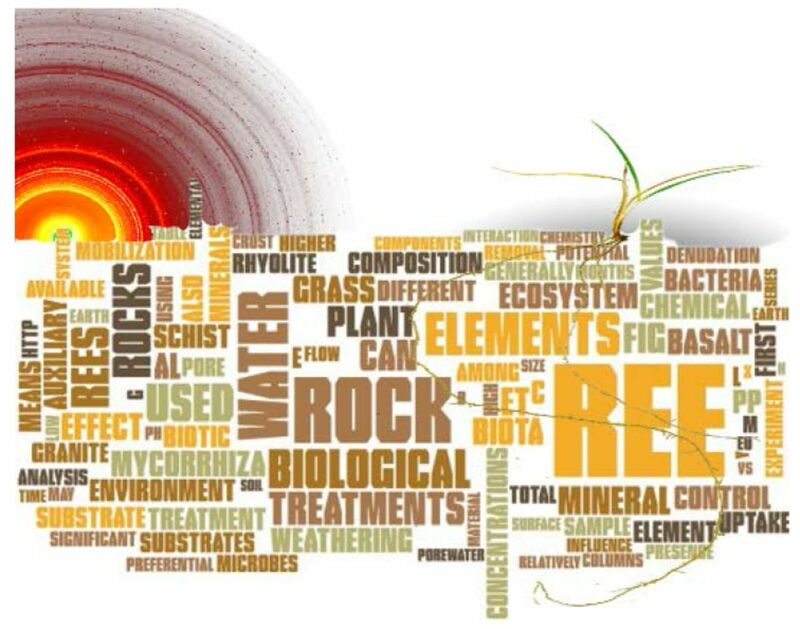 We used a model rock-biota system to demonstrate that ecosystem composition (microbial and plant) regulates the fate of REE during early biota-rock interactions. Graphical abstract word cloud with article keywords, Buffalograss, and X-ray diffractogram. The rare earth elements (REE) are of increasing importance in a variety of science and economic fields, including (bio)geosciences, paleoecology, astrobiology, and mining. Despite their great promise, REE fractionation in early plant-microbe-rock systems has largely remained elusive. We tested the hypothesis that REE mass-partitioning during the incipient weathering of basalt, rhyolite, granite and schist depends on the activity of microbes, plant, and arbuscular mycorrhiza. Pore-water element abundances reflected a rapid transition from abiotic to biotic weathering, the latter associated with lower aqueous loss and higher uptake. Abiotic dissolution contributed 38.6±19% to total denudation. Microbes incremented denudation, particularly in rhyolite, this effect associating with decreased bioavailable solid fractions in this rock. Total mobilization (aqueous+uptake) was ten times greater in planted treatments compared to abiotic control, REE masses in plant generally exceeding those in water. Plants of larger biomass further increased solid fractions, consistent with soil genesis. Mycorrhiza had a generally positive effect on total mobilization. The incipient REE weathering was dominated by inorganic dissolution enhanced by biotic respiration, the patterns of denudation largely dictated by mineralogy. A consistent biotic signature was observed in La:phosphate, mobilization:solid fraction in all rocks, as well as in the general pattern of denudation and uptake.